"Don't Jump", shouted the presumptive Democratic Presidential nominee to the latest person to undergo vetting for the VP position on his ticket. And after I tossed my medals, er ribbons over the fence the wind caught 'em and they fell back down in my office. I don't usually respond to spam, but let me tell ya, this stuff really worked! "You put your first vote in, you pull your first vote out, you put your next vote in and you nuance all about. "You do the Hokey Pokey and you turn your stance around, that's what it's all about. Hey!" 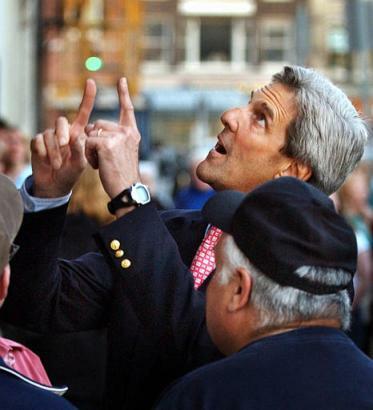 As the Pope-mobile whizzes by, presumptive NARAL ally John Kerry uses a fishing analogy to demonstrate for His Holiness the upper size at which it's still OK for an embryo to be "thrown back." I'd like to thank Pat Curley, a long-time CQ reader, for guest-judging this week's contest, and don't forget to drop by his blog. Comments on this post will remain open, as usual, in order for the winners to gloat, the others to disparage Pat's intellect and my parentage, and for any other entries submitted just for the sheer enjoyment of amazing your friends and confounding your enemies. I already have the picture picked out for Friday's contest, and I'm hoping to have the judge announced in conjunction with an announcement of other changes at CQ. 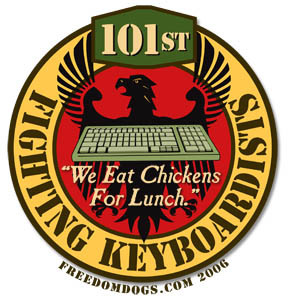 Be sure to get your keyboards ready for the next contest!